Coming out of left field to tickle your ears and mess with your musical mind is the wacky, whimsical, and wonderful Birds and Buildings with their second album, Multipurpose. This Washington DC based band blends everything from rock to jazz, symphonic to avant garde, music to create clever and entertaining concoction of progressive rock fusion. 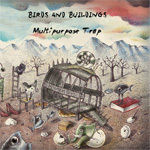 Coming out of left field to tickle your ears and mess with your musical mind is the wacky, whimsical, and wonderful Birds and Buildings with their second album, Multipurpose.